This post is about King Rat, a semi-autobiographical novel set in Singapore’s Changi prison camp during the final days of World War II. In the novel, a young Brit (a character who represents the author) is befriended by an enterprising American who has amassed a surprising amount of power via surreptitious trading within the Japanese-held POW camp. This debut novel, treating a variety of themes more or less closely related to wartime ethics, was an immediate bestseller when published in 1962. 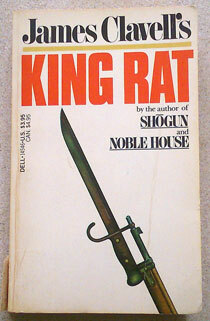 King Rat and other successful novels in Clavell’s Asian Saga (including, famously, Shogun) have been adapted into television miniseries. See below to find out what you need to know to decide whether you should read King Rat, or what you should know about it even if you never do! What is life in the camp like for the POWs? At first, the condition of what is simply called “Changi” shocks us; then, like the prisoners themselves, we become so institutionalised that at the end of the novel, Changi’s sharp contrast with the outside world shocks us all over again, and we emerge from the tale blinking to adjust our vision and questioning what is real. In the novel, British and Australian enlisted men live in an overflowing jail watched over by Korean and Japanese guards. Officers, and the handful of American enlisted men, live in concrete barracks or thatched huts on the prison grounds. Prisoners are relatively free to move about the camp in the daytime but are not allowed outside it except when escorted out on work parties to cut down trees, for example. Working in the sweltering equatorial jungle is tiring and dangerous, but affords welcome opportunities to forage for food. Indeed, though confinement in crowded, primitive tropical lodgings is unpleasant, it is the lack of medicine and food that causes the greatest suffering among the prisoners. Illnesses that could be prevented or cured with common drugs or better nutrition result in needless disability, pain and death. Rations consisting mainly of rice are strictly measured, barely keep the men alive, and are sometimes further reduced as punishment. The acquisition and protection of supplementary food items such as hens’ eggs has necessitated the formation of “units”, groups of approximately three men who look out for each other according to a strict code of loyalty. What is life in the camp like for the King? Buying and selling within the camp is an illegal yet commonplace practice, and there is no better trader than the King, an American corporal with a knack for making profitable deals. When anyone wants to sell a prized possession such as a lighter, he contacts the King to sell it, for a modest fee. A charismatic figure, the King draws RAF Flight Lieutenant Peter Marlowe into his circle and involves him in his daring schemes, repeatedly calling on his skill in speaking Malay. Because he is so successful at exploiting opportunities, the King has everything he needs or wants. Unlike those around him, he has a stash of coffee, seemingly innumerable eggs and packs of quality cigarettes, at least one set of clean and presentable clothes, and money to pay others to scout, cook, clean and do errands for him. The King delights in his wealth and power; he is always thinking three steps ahead of those around him, orchestrating events so that every day brings him still more success, resources and influence, which he expends generously on behalf of his friend Marlowe. Marlowe is at times deeply uncomfortable with the King’s opportunism, especially when the King’s dealings benefit him, yet finds it difficult to condemn his actions. What makes the story powerful? The setting is powerful, but the characters still more so. However you judge the King, you cannot do otherwise than marvel at his limitless ingenuity. Marlowe, meanwhile, is not just the author's avatar, he is ours, too. We feel his admiration, gratitude, envy and discomfort when he spends time with the King, and we laugh when the King misunderstands some aspect of his Britishness. We feel his disdain for the bitter working-class man who, aspiring to a higher rank, prowls around intent on enforcing camp rules against black-market trading. We feel his longing to be with his erstwhile Javanese lover. We feel his guilt over his harsh treatment of Sean, a friend who has taken on a female identity. We feel his anxiety over his unit’s dangerous mission to keep the camp up-to-date with news of the ongoing war, whose end could herald the salvation—or the massacre—of all the Changi POWs. In the end, we feel his despair when he falls ill, knowing that even his friendship with the King, who has recourse to solutions that others do not, may not be enough to save him. Is the book in print? Yes, though the image above is a photo of my 1983 paperback. In fact, all the books in Clavell’s Asian Saga, including King Rat, are currently available with updated cover designs in print and digital formats.